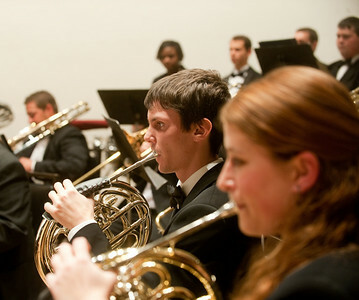 Indiana State University's Wind Orchestra and Concert choir will perform at 7:30 p.m. Friday, April 9 in Scottish Rite Cathedral, 650 North Meridian Street in Indianapolis. "This is a valuable opportunity for our musicians to showcase their talents in Indianapolis at an extraordinary venue," said Nancy Cobb Lippens, chairperson of the Indiana State music department. "We are bringing the sounds of Indiana State to our alumni and friends in the metro area. We hope they will come out and support our students for this special evening." Indiana State's Concert Choir, under the direction of Scott Buchanan, will take the stage first. The 45-member choir will perform seven numbers, including Bjorn Andor Drage's Brudemarjs fra Sørfold, René Clausen's Prayer, and Darla Eshelman's And God Gave Music . After a short intermission, Indiana State's Wind Orchestra, under the direction of John Boyd, will take the stage. The 47-member orchestra will perform Alfred Reed's Armenian Dances (Part 1) and Modest Mussorgsky ‘s Pictures at an Exhibition- The Great Gate at Kiev. The 90-minute concert will conclude with both ensembles combining to perform seven movements from Carl Orff ‘s Carmina Burana and The Battle Hymn of the Republic. The event provides a unique opportunity for two very different musical groups to perform together. "We're performing some really beautiful music It's a great, eclectic mix of music," Shelley Mitchell, a music education/vocal performance major from Batesville, said of the program. "I'm really excited about it." ""We're not just singers or saxophone players or trumpet players, we're musicians so this is a wonderful opportunity to all come together as musicians and perform great music," said Michael Baum, a music education major from Dyer and a saxophone player in the Wind Orchestra. While ISU music students regularly perform on campus, the short trek to Indianapolis offers a different form of experiential learning, Cobb Lippens said. "It's different when you have to pack up, make sure you remember everything and you go somewhere and all of a sudden 100 people directed by a couple of faculty members have to learn how to play and sing in a new venue," she said. The concert is free, but tickets are required due to limited seating. To obtain tickets, contact Julia Lee at 812-237-2339 or Julia.Lee@indstate.edu. The Wind Orchestra and Concert choir will perform at the Scottish Rite Cathedral.